Pectoral cross - A155 (with chain) - Istok Church Supplies Corp. This clergy pectoral cross of unusual design is made of brass and covered with 24K silver-gilding applied by galvanic method. The cross is wide in thickness, about 1 cm. 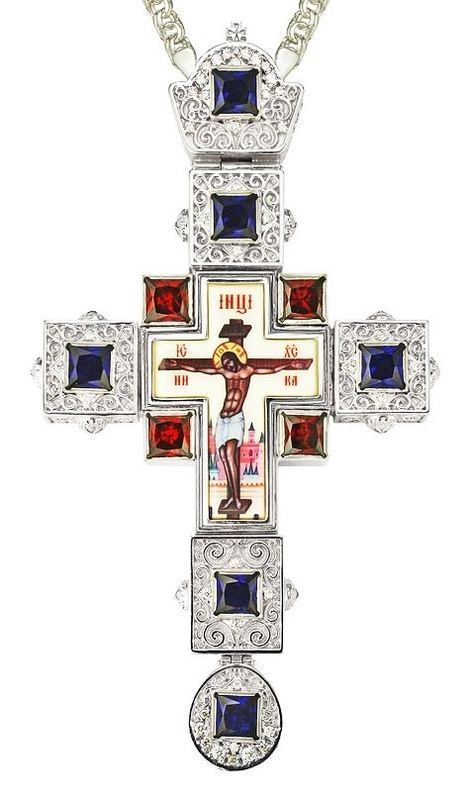 The main decoration of the cross are large, fine-quality cubic zirkonia, hand-clipped. 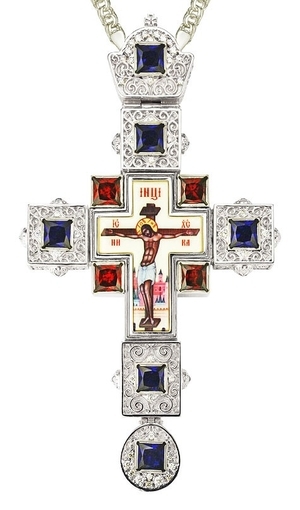 The ends of the cross are decorated with floral ornamentation and casted appliques. The large crucifixion is made using a special technology of color image imprinting on a brass base. It is coated with a composition that protects it from mechanical damage and exposure to light.